If you love music as much as whitewater rafting, now’s your chance to purchase tickets for the three-day Mountain Music Festival at ACE Adventure Resort that include an exclusive raft trip with the festival’s top bands. Two of 25 bands playing the June 1-3 festival will raft Saturday during an excursion open to festival-goers who purchase a special package, says Chris Colin, special-events coordinator for the resort. The chance to share a day on the New River with the band is just one component of what the package offers, Colin says. 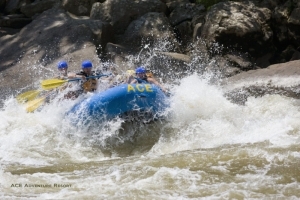 The Epic Adventure Weekend pass includes a three-day festival pass, three nights of camping, a Saturday pass to the resort’s Wonderland Waterpark, VIP tickets, and a half-day rafting trip on the lower New River. The resort’s new outdoor venue near Oak Hill, West Virginia, boasts four stages, 25 vendors, on-site camping, and an array of outdoor-adventure activities close-at-hand for both performers and visitors. “One of the things we like to do with our festival is incorporate rafting and zip-lining, and the bands and the artists actually participate in these activities,” Colin said. The $300 package also comes with the option of zip-lining instead of rafting, but for the chance to spend the afternoon with the bands, choose the rafting option. Guests who stay for two days may purchase the same pass for $270 and still have the opportunity to raft with the bands. In addition to BIG Something and Twiddle, other bands may join the trip as well, Colin said. “For the bands that can fit it in, it’s a mini-break in their rigorous tour schedule,” he said. This will be Big Something’s second time taking part in the annual rafting trip and the first time for Twiddles, Colin said. The Saturday rafting trip sold out last year, and about 50 spots are already sold for this year’s adventure, he said. The three-day festival tickets are also limited, he said. Tickets may be purchased online, and ticket giveaways will also be held every Friday up until the festival. More information on the Mountain Music Festival may be found on Facebook.